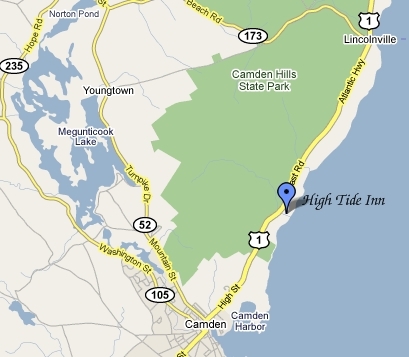 High Tide Inn is located on Route 1 on the Oceanside. A scenic drive along the coast of Maine. From There to High Tide Inn . . . Follow Interstate 95 north to Exit 44, Interstate 295. Follow Coastal Route 1 north through Waldoboro, turn left onto Route 90. Follow Route 90 until it ends at the junction of US Route 1 again. Turn left onto Route 1 north, down through the village of Camden. Continue on Route 1 (The Belfast Road) for 2.5 miles beyond the Camden Public Library (library will be on your right, across from the intersection of Routes 1 and 52, as you head out of downtown Camden). Continue on Route 1 north, down through the village of Camden. Continue on Route 1 (The Belfast Road) for 10 miles.